STAY TUNED FOR GREAT THINGS WITH CENTRAL, H.S. SONGS OF SOLOMON CHOIR WITH 60 CHILDREN'S VOICES AND ORCHESTRA WITH SOLOIST, RAEMOND MARTIN, ALTEOUISE DEVAUGHN,STEVE OOSTINGS, GRETCHEN STALNECKER, KEVIN MAYNOR, AND ,NEWARK STAR LEDGER AWARD WINNER KENNETH ELLERBEE PERFORMED THE MAGNIFICENT PIECE WRITTEN BY MICHAEL RAPHAEL AND LED BY MAESTRO JULIUS WILLIAMS. TREEMONISHA REVISITEDT.J. 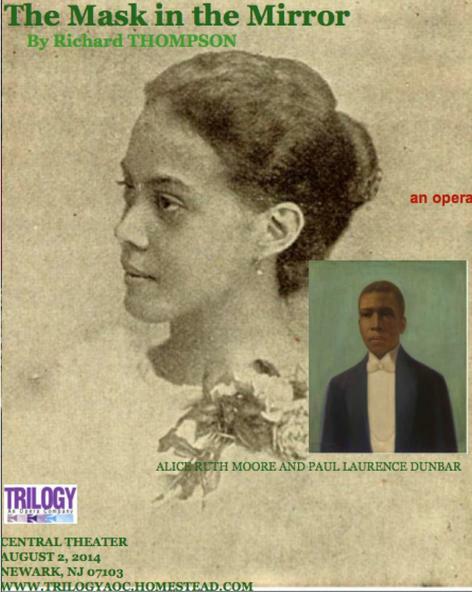 AndersonJanuary 2010 We stand on the eve of the 100th anniversary of the Scott Joplin opera,Treemonisha (1911). What meaning does this work have for the current generation and what is its importance in the history of American opera? In our epistemological concerns, what questions arise? Does the work promulgate enduring values? Does it promote pride in heritage? Does it serve as a reminder, lest we forget the experience of slavery? I would say the answer to these these questions is a resounding, yes. Opera is a generic form that reflects a particular culture. It may show the influences of other nationalities but the dominant thrust is the composer’s life experiences. The opera,Carmen by the French composer, Georges Bizet is influenced by Spanish music. Giacomo Puccini’s Madama Butterfly shows the influence of music of Japan, yet, it is an Italian opera. The Ice Break by the British composer, Michael Tippett reflects American music. An American opera, it seems to me, should be written in the dominant language of the country, by a citizen or immigrant and should be reflective of a national social experience. It must also reflect the sounds of the culture and must make use of the melodic, harmonic, rhythmic and formal structure of our popular culture. Treemonisha and Porgy and Bess possess those elements. In 1794, James Hewitt wrote the United States’ first grand opera, Tammany. That work along with others that followed can only be described as a continuation of European opera. In 1911, Scott Joplin wrote Treemonisha and paid to have it published. Its polarity of thought, assimilated black identity and the influence of classic European opera of the Eighteenth century are distinctive. The overture, arias, recitatives and small orchestra are all there. The story and the libretto are products of his imagination. This opera was an aesthetic calculation of the American musical experience and the cultural adaptation of his personal expression. The opera takes place just after the Civil War in the south. Monisha and Ned find a baby under a tree. They decide to name her Treemonisha. The child is sent away for an education and later returns to a community riddled with superstition and witchcraft, Treemonisha tries to teach her people the value of education and after a struggle with these forces of witchcraft she becomes their leader. All the villains of superstition are forgiven. Joplin tried to stage the opera without success during his lifetime. His inability to find financial backing may have been based on the determination not to recognize his opera as an American opera; an unwillingness to give it proper status. On January 28, 1972 the first performance of Treemonisha was held in Atlanta, the culminating event of a week long celebration by the African American Workshop, under the direction of Wendell Whalum, Richard Long and me. During that week, there were several lectures, one of them on Paul Robeson. A paper was given by the distinguished educator, Dr. Benjamin Mays and a concert by a female gospel choir was presented in the Morehouse College Chapel. In addition stellar practitioners of ragtime, Eubie Blake and Max Morath participated in a workshop. The opera was sponsored through a grant through Norman Lloyd from the Rockefeller Foundation. Treemonisha’s remaining piano-vocal score, was called to my attention by William Bolcom. Joplin’s orchestration was lost. With slight assistance from me, this distinguished composer edited the piano-vocal score. Later, I orchestrated the opera. The premiere performance featured the conductor, Robert Shaw, stage director and choreographer, Katherine Dunham, Singers; Alpha Floyd, Seth McCoy, Simon Estes, Laura English, Louise Parker, Joseph Bias, Uzee Brown, musicians from the Atlanta Symphony and singers from the Atlanta University complex. To further understand the importance of this event, we must review America’s operatic history. I believe an opera written in this country must have an indigenous, perceptive and emotional response to the American experience. It must also be rooted in the culture. There are two early examples of American opera; Scott Joplin’s Treemonisha(1911) and George Gershwin’s Porgy and Bess (1935). Both works take place in the south and both have African American life style as the focus. While they have much in common, both works suffered at their inception from the paradoxes of understanding, Joplin’s unsuccessful ability to find financial backing and Gershwin’s negative reviews of the premiere. Neither work is esoteric. Joplin takes the high road of transcendental values. His emphasis on education is reflected in the establishment of several African American universities ( not colleges) after the Civil War. Lincoln, Shaw, Johnson C. Smith, Howard and Langston University are examples. The Gershwin opera is an extension of 19th century grand opera and takes the low road in telling its tragic story. The Du Bose Heyward story on which the opera is based, leads us, with the influence of street cries, to witness a life of killing, whiskey, gambling and narcotics; the low life. Ira Gershwin wrote the libretto. Both Joplin’s and Gershwin’s works are poetical, emotive, and represent the perpetuation of relative truths. In Scott Joplin’s opera, one finds the influence of cultural language in the form of congregational singing. Ragtime, marches, male quartet, stylized dance steps, and songs form the coexistence of generative powers. The use of unspecified pitches in the score, a probable extension of church moaning rituals, is seen with stem rotation.No note heads but contour rhythmic lines. It is interesting to observe that Arnold Schoenberg created Sprechstimme in his composition, Pierre Lunaire (1912). Both composers were trying to expand with gliding vocal lines the dramatic possibilities of music. I doubt if they ever met. Porgy and Bess has as its domestic motivational influence the use of Jazz, Tin Pan Alley, Blues, Gospel and the 19th Century European grand operatic tradition. In comparing the two works, one is infused with ragtime (1890-1920) and the other with Jazz (1920 to present). Ragtime was predominately a piano art form which was notated. Jazz has had an extended life because of improvisation. This unique form of freedom is indeed expressive and important. The long history of jazz can be attributed to the ability of jazz musicians to reinvent themselves through innovative solos. Invented by African Americans, both ragtime and jazz styles became international. It is interesting to note that our greatest singers, Roland Hayes, Marian Anderson, and Paul Robeson never participated in Porgy and Bess. All life moves on a time continuum towards identity. Nationalism in music is the result of the interrelationship of social and political exchange. Secular and sacred music have a common identity in the lives of their musicians. As this nation moves into the 21st Century with its complexity of problems, development of new technologies, and the opportunity for global solutions, we must always be mindful of the importance and understanding of history and its significance to future generations. BEAUTIFUL THINGS TO COME AT CICELY TYSON...WATCH!! !